The planet Mercury, as well as being the smallest in our solar system, is the closest one to the Sun. It is one of the four "terrestrial planets" that form the inner solar system. As can be seen from this photograph, taken by the space probe Messenger, the planet Mercury is similar in appearance to the Moon. Like Earth's satellite, it is pitted with craters and features huge flat plains. These features show that it has experienced no geological action for billions of years and is, essentially, a dead planet. It has a diameter of about 3032 miles (around one third the size of Earth) and weighs approximately 3,800 million million million tons, making it the lightest of all the planets. The planet Mercury has the fastest orbit around the Sun, taking just 88 days for one revolution. During this orbit, its distance from the Sun ranges from 43 million miles to as close as 29 million miles. It was once thought that Mercury always kept the same side facing the Sun, in much the same way the Moon does with Earth. Now, new findings show that it does, in fact, rotate - very slowly. One Mercury day is equivalent to 59 Earth days. So, every time it makes one revolution of the Sun, it has rotated 1.5 times. 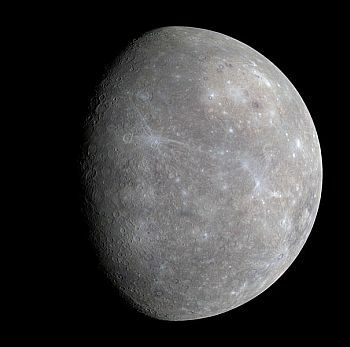 Because the planet Mercury is too small for its gravity to retain any sort of atmosphere, the surface is subject to huge variations in temperature, according to whether it's facing the Sun or not. During Mercury's day, its surface can reach 430 degrees Celsius, while, at night, temperaures plunge to -170. Despite being the smallest planet, Mercury is the second densest in the solar system (Earth being the first). This is due to the relatively large core at its centre, plus the fact that this core is made up of iron. The crust (number one in the diagram) is estimated, very approximately, as being 125 miles thick. The latest findings, by the Messenger probe, show that there are particularly high levels of potassium and sulphur on the surface. This, apparently, suggests that, when Mercury was forming, lighter elements were dragged away from the protoplanet by nearby solar nebulae, resulting the the predominance of heavier elements. This, in turn, accounts for the huge iron core and the planet's high density. The crust displays, as well as the craters and flat plains similar to our Moon, deep ridges and huge cliffs, some a mile high and extending for hundreds of miles across the surface. 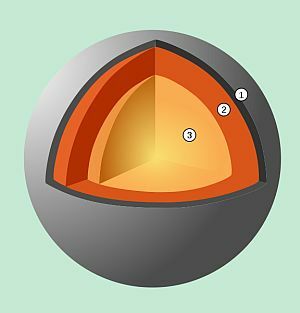 The mantle (number two) is 375 miles thick and is composed of lava rich in silicates. The impressive core (number three) extends almost halfway to the surface and, as said earlier, is made up of iron. Recent findings suggest that this iron exists in a molten state. Why Mercury should have such a huge core has puzzled scientists. 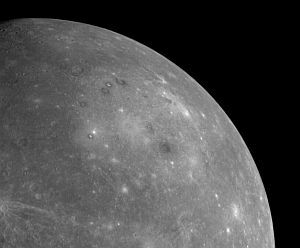 Amongst Mercury's surface features is a huge impact crater called the Caloris Basin. Estimated at around 960 miles in diameter, it is one of the largest of its kind in the entire solar system. First discovered in 1974, it is surrounded by mountains over a mile high. The Caloris Basin, in the centre of the image. You can just make out a huge circle. The planet Mercury, small in size, but big on features!